Over 30 years of genealogy research on All These People who ended up with me. Not all of the information may be correct or accurate - some of it is simply best guess. That's the nature of genealogy - we make a best guess, but we're always looking for surety, and everything is subject to change. If you see something that is missing or isn't quite correct, please contact us, or use the suggestion tabs so we can correct it. For many years I've been unable to determine the parentage of my great-grandparents William Andrew Smith and his wife Elizabeth. With the pillaging of courthouse records during the Civil War, and the destruction of the 1890 census, I was beginning to decide there simply was no way to get any further than what I could find in the existing census records for McMinn County, Tennessee. In late 2018 I took yet another DNA test, this time with Ancestry.com, and I found a cousin connection who listed a grandparent as Arvil Smith. Sure enough, Arville Willie Smith, born in 1905 in Athens, Tennessee turned out to be the link I could use to trace back to my William Andrew Smith. It turned out that Arville was a son of Marion Francis Smith, also a fairly easy name to trace in that time and place. I found Marion F. Smith in the 1860 census of McMinn County, where he was age 6, living with his mother Elizabeth, sisters Margaret and Fanny, and a brother William - who appeared to be the right age as my missing William. Further searching showed a family in Roane County, Tennessee in the 1850 census, Robert Smith, born about 1816, his wife Elizabeth born 1821, and their children Margaret, Fanny and William. So, without anything to indicate otherwise, for now, I'm satisfied this is my William A. Smith, with his father Robert and mother Elizabeth. Robert was apparently from Maryland, Elizabeth from Virginia, and since Margaret, their oldest child was 12 in 1850 and her birthplace was listed as Tennessee, I'm hoping to eventually dig up more records to confirm this is the family. We found my father's grandparent's marriage record in Ohio with both of their parents listed on it. So we now know Grandma Barat's birth name was Theresa Kosar, and her parents where Louie Kosar and Theresa Japura. It's very likely she came to America from Hungary in 1912 with her parents, as she was only 12 years old. Her husband, George Magos's, parents where George Magos and Rose Kish. George was about 23 when he came to America from Hungary in 1913. I finally connected our Great-Grandfather John Chase Eggleston to some parents. He was born in Troy, New York and as a child, moved to Michigan. As a young man of 20, he and his brother Charles moved to Waupaca County, Wisconsin and took up farming. Waupaca County was giving out homesteading grants like mad during the 1850's. He married Lydia Anna Chrisman Smith - her first husband Charles W. Smith had died shortly after the civil war - and they had 4 more children - including Nanny, Dora Rosetta Eggleston, - the youngest. 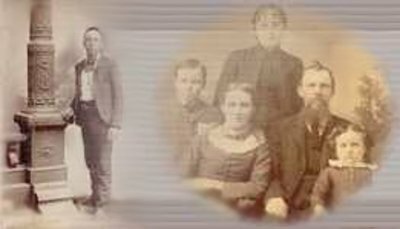 In the 1880's they moved back to near his childhood home in Michigan and took up hotel keeping -- you can find them in the 1910 census - but he became ill and they returned to Wisconsin shortly after the census of 1910 - and he died in 1912. I've been able to connect this line up to Bygod Eggleston - a very early settler to Connecticut (mid 1600's). This was a dead-end for 20 years or more. Pursuing the Michigan angle is where I was able to plug him in to another family.